When you’re trying to unlock the secrets of the universe, it appears that bigger is definitely better. The Large Hadron Collider’s very name says it all. To researchers it’s the biggest and most powerful high-energy particle accelerator in the world. To the rest of us, it’s the largest machine of any kind humanity has ever constructed. The LHC’s doughnut-shaped collider tunnel is 27 kilometres in circumference and runs under the Swiss/French border at a depth of up to 175 metres. Too monumental even for a single country, it seems. 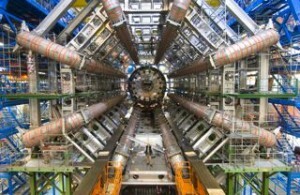 On Wednesday, the Large Hadron Collider (LHC) underwent its historic first dry run. For the first time, a single, high-energy proton beam was accelerated around the collider ring at 99.99 per cent of the speed of light. 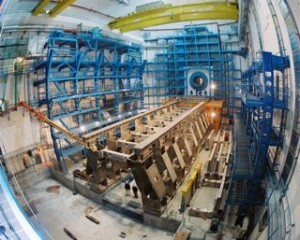 The event was a dress rehearsal for the later main event, when two proton beams will collide. “This will help us better understand nature at its smallest scale,” said Dr. Brigitte Vachon, Assistant Professor at McGill’s Department of Physics, and Canada Research Chair in particle physics. She noted that the experiment will emulate conditions in the first few micro-instants in the life of the universe – immediately after the Big Bang. 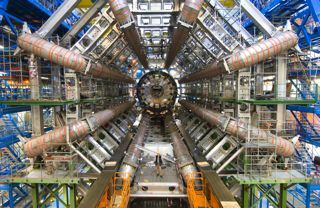 Since the early 1980s, when the LHC was first conceived, more than 8,000 researchers from 85 nations have participated in the project, which is headquartered in Geneva and operated by CERN, the European Organization for Nuclear Research. McGill contributes under the auspices of the 11-institute ATLAS-Canada consortium, and has played a central role in the creation of ATLAS, a massive detector that will search for exotic new particles unknown to current science. The McGill ATLAS team includes Vachon, François Corriveau, Steven Robertson and Andreas Warburton, who collectively helped develop a trigger system that allows the device to identify the information from interesting collisions taking place inside the detector.